is a disease that is rapidly growing among people all over the world. The number of people having type 2 diabetes and the people prone to develop diabetes called prediabetes has increased drastically over the last few years. Diabetes is a disease in which the sugar level in the blood is very high. Diabetes is classified into two categories, type 1 and type 2. Two things are important to keep in check to determine the type, insulin hormone and glucose. The body gets the glucose from the food and the insulin hormone is responsible to get glucose in the cells which then produce energy. The lack of insulin in the body is referred to as type 1 diabetes. Whereas if the body is unable to produce or use the insulin in the body properly then this is classified as type 2 diabetes. The usual treatment of diabetes includes medications or insulin injections along with diet restrictions. But there might be another treatment that can be quite effective. There has been a lot of research going on a compound known as cannabidiol or CBD. What is CBD best for? This chemical compound is said to treat a number of diseases like cardiovascular diseases, depression, diabetes, and atherosclerosis. An Israeli scientific CEO Mark J. Rosenfeld has stated that the treatment through CBD might help reverse, suppress and ultimately cure diabetes. CBD is found and extracted from the cannabis plant. This compound does not alter the mind state and can be used in the form of its oil and can be infused in other products as well. Using cannabidiol for diabetes can treat the chronic inflammation. Chronic inflammation leads to insulin resistance which causes type 2 diabetes. CBD also improves the metabolism rate of the body, immune system, and also cell growth through its many anti-inflammatory properties. All the studies that have been conducted on the effect of CBD on diseases like diabetes and other diseases have shown promising results with respect to prevention and cure. The chemical compound CBD can be used in a number of ways like the CBD oil and can be infused in other products as well. CBD oil is the most common form available. CBD provides a number of benefits, its anti-inflammatory properties makes it capable of preventing and treating diseases like diabetes. There are several ways in which CBD might help people with diabetes. 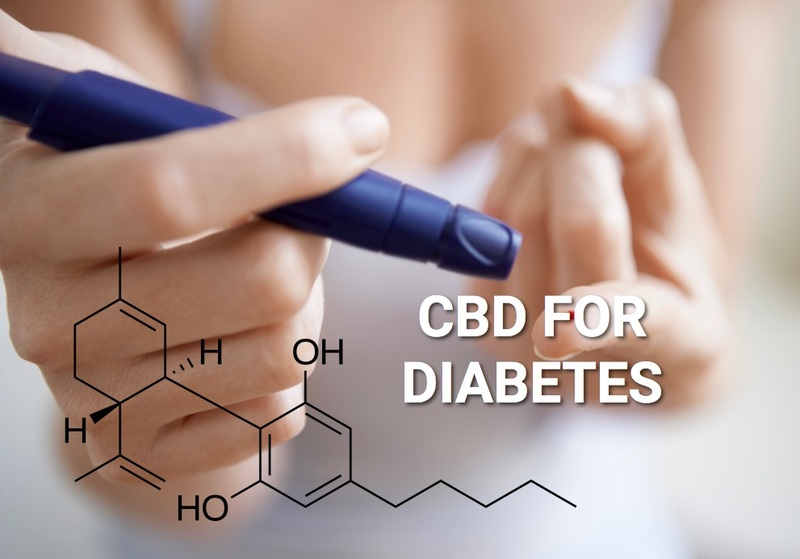 One of the most significant way CBD might help with fighting diabetes is preventing it in the first place. People who have prediabetes, ones which are likely to develop diabetes can benefit from CBD as it decreases the fasting insulin levels, increases HDL cholesterol, and lowers the insulin resistance in the body. Pancreas produce insulin which help regulate the sugar levels in the blood. If the body rejects insulin this results in insulin resistance. In this condition the cells in the body do not absorb the sugar from food and it starts to accumulate in the blood raising the blood sugar levels. The anti-inflammatory properties of CBD reduce the inflammation which improves the immune system and cardio health. This improves the absorption of sugar by the cells. Obesity also raises the risk of diabetes, specifically type 2 diabetes. Obesity leads to insulin resistance which hinders the sugar absorption by the cells in the body. CBD helps in elevating body’s metabolism rate which results in reduced waist circumference, higher HDL cholesterol levels, decreased triglyceride levels and weight loss. CBD might also help manage cravings and overeating by acting as an appetite suppressant. It reduces the urge to eat more by sending satiety signals to the brain, this helps people stay away from food which leads to better health and weight management. CBD improves the rate at which the body burns calories, this helps in weight loss. After I was diagnosed with type 2 diabetes on June 26, 2018, I was placed on Metformin and began some diet immediately. Expecting some changes in my blood sugar level, I followed this diligently for a few weeks. Despite my efforts, my blood sugar remained above 140. After making inquiries from my doctor I was told nothing could be done about my case and I would be stuck this way, taking Metformin and eventually insulin for the rest of my life. Unconvinced, I set out to carry out my own research. Luckily I came across Eda’s story (google ” How Eda freed diabetes ” ) on the 13th of August. I could relate to all the write up contained and it made sense. I decided to follow the diet and I started immediately. The results were instant. By the following morning, my blood sugar level was down to 100. Today it is stable between 70+ and 80+. I got off metformin as I’ve always wanted and within a month I was able to lose 30 pounds. I am convinced beyond all doubts that one can get off drugs through natural methods.